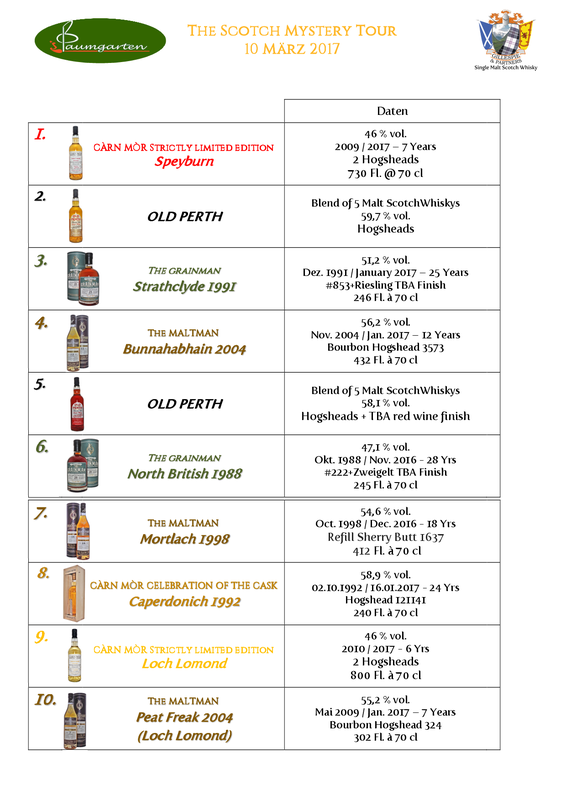 All Scottish whiskies will be tasted as number 1 – 9 unaffected by name, age, etc. Don’t worry, There is no need to guess one of the whiskies. Maybe there will develop some lively discussions at the tables. At the end of the tasting the solution takes place. The attendance fee for the „Scotch Mystery Tour“ for Càrn Mòr Society Members and their friends will be incl. menu € 48.00 p. P.
Please note – a minimum number of guests of 25 will be required, the maximum number is 35 guests. Please transfer the attendance fee of € 48,- to our account IBAN: AT02 2011 1300 0106 5720, Konto Nr. 300010-65720, with Erste Bank AG, BIC: GIBAATWWXXX, BLZ 20111, Recipient: Gillespie & Partners GmbH, Kantgasse 3, 1010 Wien, reason for payment „Name (John Sample) and „Tasting 10. März 2017“. In addition please book by e-mail to office@gillespiepartners.com. Big guesswork at the „Scotch Mystery Tour on the 10th and 11th of March. No hidden malignity or plain evilness were hidden in the programme. Surprise – yes! In particular two blends of malt whiskies bottled at cask strength and two single grain whiskies finished in a “Trockenbeerenauslese” cask (= late harvested sweet wine matured in oak casks) provided by Helmut Gangl of Illmitz, one of the great producers of Austrian sweet wines. Throughout the guests have welcomed this new format for a tasting – if this was due to the excellent food served prior to the tasting has not been finally decided. In any case, we intend to incorporate this new format in one of our next tastings.